Brooms and pickles seem like an unlikely combination for a manufacturing company, but C. N. McHugh produced both in this building, located just north of the intersection of Main Street and U.S. Highway 57. The building had many uses. It was constructed in 1862 for the production of cornstarch and it was later used for the manufacture of wooden pumps, oatmeal and washing machines. 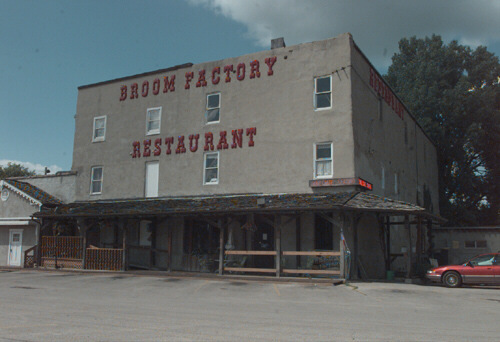 It finally became a broom factory in 1905. McHugh was in the broom business for about 40 years in Cedar Falls. This was a highly profitable enterprise until the introduction of vacuum cleaners made brooms less important. McHugh was not alone in the broom business in Cedar Falls. In the early years of the twentieth century, the Cedar Falls Broom Works at 429 Fourth Avenue and the Cedar Falls Broom Company at 205-1/2 Main Street offered competition. McHugh was also the agent for a large pickle maker. He purchased loads of cucumbers from farmers north of town. Most of these cucumbers were shipped to a larger plant for processing, but the largest ones were made into dill pickles in this building's brine vats. In addition to his broom and pickle business, McHugh was also a politician. He served as mayor of Cedar Falls from 1935 to 1943 and was an active supporter of riverfront restoration and the establishment of city parks. McHugh was popularly known as the "Pickle Mayor." He gained public support and recognition by generously donating pickles to church suppers, lodge dinners and other charitable events. The broom and pickle factory has been converted into The Old Broom Factory Restaurant, a practical use for one of Cedar Falls' last remaining riverfront industrial buildings. The building is listed on the National Register of Historic Places.